You are here: Home / christmas / Isabella’s Second Christmas – Pics!! Isabella’s Second Christmas – Pics!! This year was my daughter Isabella’s second Christmas. I thought I went overboard with her first Christmas, but I went even more overboard THIS year! My excuse? GIVEAWAYS. I love entering giveaways for toys then saving them for birthdays and future Christmases. I’ve been holding on to a certain toy since MARCH!! She finally got it for Christmas, and she’s in LOVE. See below to find out what it was. It is/was my biggest giveaway win to date. I won that kitchen from Shining2Save back in March! Yep. That’s me. Hooray for looking like I’m 16! What did Santa leave for me? A KINDLE FIRE!!! Woooooooooooo!! I LOVE it! 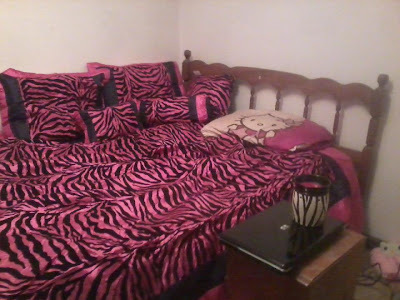 I also got a pink/black zebra print Kindle Fire case, pink/black zebra print bedding set, zebra print counting coin bank, Hello Kitty pajama set, two other pajamas, and a bunch of KitKats and Reese’s. Great pictures. Glad you had such a wonderful Christmas!! God bless. That's a terrific kitchen… I'm sure she's loving it. 🙂 I won giveaways for a couple of items that I gave to friends for Christmas. Gotta love giveaways! Quite a few of my Christmas gifts came from giveaway wins. Sure helped financially. That play kitchen is super cool. I received some nice gifts…microfiber plush blanket, metal wall clock, photo collage frame, pajamas, Water for Elephants book, Ferrero Rocher chocolates, and more. Glad you and the little one had a wonderful Christmas!